We see your sales potential, now let's help you achieve it! 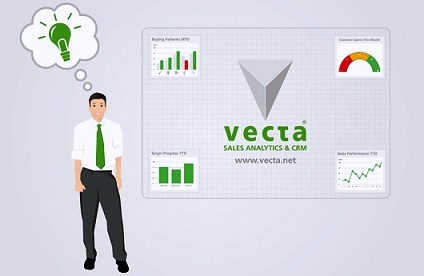 No ordinary CRM, Vecta is the cloud Sales Intelligence & CRM which helps manufacturers, distributors and wholesalers increase sales by up to 60%. Using and transforming existing customer and data, Vecta automatically uncovers new opportunities and directly alerts your sales team. The sales tool that helps boost results and beat targets, Vecta ensures that every individual is fully prepared to be super productive and proactive on every call or visit. The all-in-one portal to store and share customer and sales information across your business. Every member of every team has instant access to a central bank of transaction and contact data. "Bringing in new sales staff became so much easier using Vecta, it means that they are immediately productive. We have seen performance from a territory improve by over 30% in these circumstances." "We've seen between 50% and 60% increase in sales of every product we targeted using Vecta. After running a campaign from our client list we doubled sales of products we targeted that month." "Vecta is the key link in our systems chain, it directs our sales people to new opportunities within the customer base. We have seen growth in our top customers of around 15% and Vecta has been instrumental in helping the team achieve this." Making your business more profitable and efficient - it's what makes us tick. Software is only ever as good as the development and support teams behind it; take comfort that our experienced and friendly team are specialists in your field.